BDS Profs: No Contact with Israelis! Originally published under the title, "BDS Profs vs. the Muslim Leadership Institute." Who would object to a program that sends American Muslims to Israel to meet with Jewish, Muslim, and Christian residents in order "to explore how Jews understand Judaism, Israel, and Jewish peoplehood"? Answer: Middle East studies professors intent on scuttling coexistence in favor of delegitimizing Israel through the boycott, divestment, and sanctions (BDS) movement. 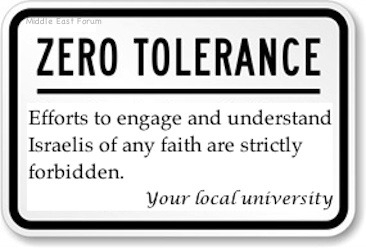 Many Middle East studies professors are intent on scuttling Israeli-Palestinian coexistence. The first petition calls "for an immediate halt" to the program, calls its financiers "Islamophobia sources," and declares, "We reject the upcoming third cohort of MLI, refuse to meet with its participants, or facilitate their visit to meet with any Palestinian." For inspiration, it cites the Palestinian BDS National Committee, which insisted on a boycott of MLI in January, 2014. Among its authors are such anti-Israel luminaries as San Francisco State University's Rabab Abdulhadi; University of California, Berkeley's Hatem Bazian and Kamal Abu-Shamsieh; Illinois State University's Issam Nassar; and Steven Salaita, the would-be University of Illinois at Urbana-Champaign professor who now teaches at the American University of Beirut. 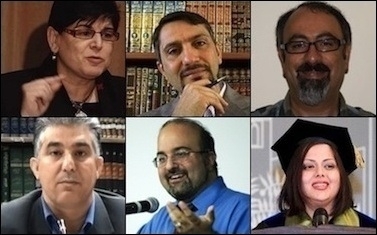 Clockwise from upper left: Rabab Abdulhadi (San Francisco State University); Hatem Bazian (UC-Berkeley), Issam Nassar (Illinois State University), Zareena Grewal (Yale), Omid Safi (Duke), and Kamal Abu-Shamsieh (UC-Berkeley). The second petition repeats the arrogant demand for an "immediate halt" to MLI, maintaining that the program is "part of the Hasbara Israeli propaganda operation," "a violation of BDS," "an Israeli attempt to 'normalize' relations," and, worst of all, "deliberately designed . . . to make Muslims more sympathetic to Zionism, and to present an anti-BDS perspective." It culminates in the inane statement, "To engage the occupier without sitting down in solidarity with the occupied first is politically delusional, morally misguided, and ethically callous." Coauthors include Bazian, Abu-Shamsieh, Duke University's Omid Safi, and Yale University's Zareena Grewal. The petitions' authors issue a set of "recommendations" that, if enacted, would effectively end the program, while complaining that SHI and Antepli, after meeting with opponents, "refused calls for reform." Accordingly, the latter has been declared "personae non grata." Earlier this year at the University of Texas, El Paso, he committed an ahistorical, moral equivalence by comparing the Islamic State to Christian "crusaders." At a 2011 Duke University conference, he made this ludicrous assertion: "Being a Muslim in the United States is another form of torture, a psychological torture, an emotional torture, and it's just getting worse." His anti-Israel commentary at a 2009 Duke "Gaza Teach In" included the claim, "As a state, Israel is shooting herself in the foot and pumping into the hearts and minds of millions of people anti-Semitism." MLI founder Abdullah Antepli's views on Israel have evolved over time. Meanwhile, MLI's academic opponents continue to fume. Sa'ed Adel Atshan, a Tufts University lecturer and BDS activist whose anti-Israel rhetoric Jewish students have described as "extremely destructive," has accused MLI of "faithwashing," or downplaying Israeli "occupation" by emphasizing the religious (i.e. Islamic supremacist) motivation of its opponents instead of defining it solely as a territorial dispute. He labels SHI a "Zionist Israeli institution" whose "role in the program," much to his consternation, places MLI "in contravention of the Palestinian civil society call for BDS." The campaign to defame MLI demonstrates how deeply embedded the BDS movement is in American universities. Kamal Abu-Shamsieh, one of the aforementioned petition authors, is a doctoral candidate at UC Berkeley's Graduate Theological Union, an Islamic chaplain, and, as he put it in an op-ed in May, "the only Palestinian-American who participated" in the MLI. 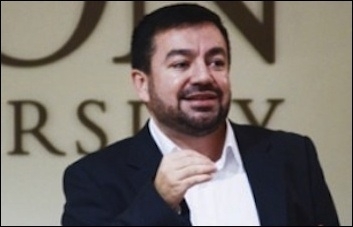 Abu-Shamsieh joined the program despite being "aware the majority of Palestinian-Americans' response to MLI was very negative" and admits that it "resulted in a better understanding of Zionism." The campaign to defame MLI demonstrates how deeply embedded the BDS movement is among professors of Middle East studies. So, too, did the Middle East Studies Association (MESA)'s passing of a resolution at its 2014 annual meeting that is likely to result in an academic boycott of Israel. When the mere act of engagement inspires hysterical opposition, we have abandoned scholarship and reason for unbridled political activism. The line between the two realms is quickly disappearing.